Another week has flown, another iron bird flown, another state and floods are on the rise! Another wet and windy forecast and a red alert in our parts. But, always a joy reaching another Texture Tuesday and exploring the wonderful world of photography. This weeks project challenge with Kim Klassen was ‘Free & Easy eDition’, one that I love where we’re free to create with any subject photo and use at least one of Kim’s fabulous textures. 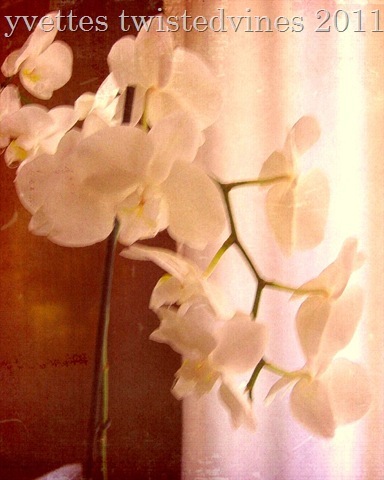 Using one of my favourite original photo’s of white orchids, lightened by natural light from my window, I used a couple of Kims textures and enhancements. Kim Klassen’s Sweettart texture + Kim Klassen’s Lifesgood texture + enhancements glow + saturation. A few darkened shadows and light touch ups. Please link up to Texture Tuesday with our host at Kim Klassen Cafe and check out all the wonderfully talented people and their inspirational photo’s. Another busy week for me, I hope to get back into routine soon. I hope you all have a wonderful week. Another beautifully textured photo Yvette. It’s always interesting to see the amazing things done with photography. It really does look like something from a dream. Very nice. So sorry your area is still in a lot of rain and flooding. Orchids are simply beautiful. I love how simplistic they are. I love this articles.. thanks for sharing this. Really nice, I second the dreamy comment! Have a great week, Yvette! Very pretty pic, I adore orchids too!